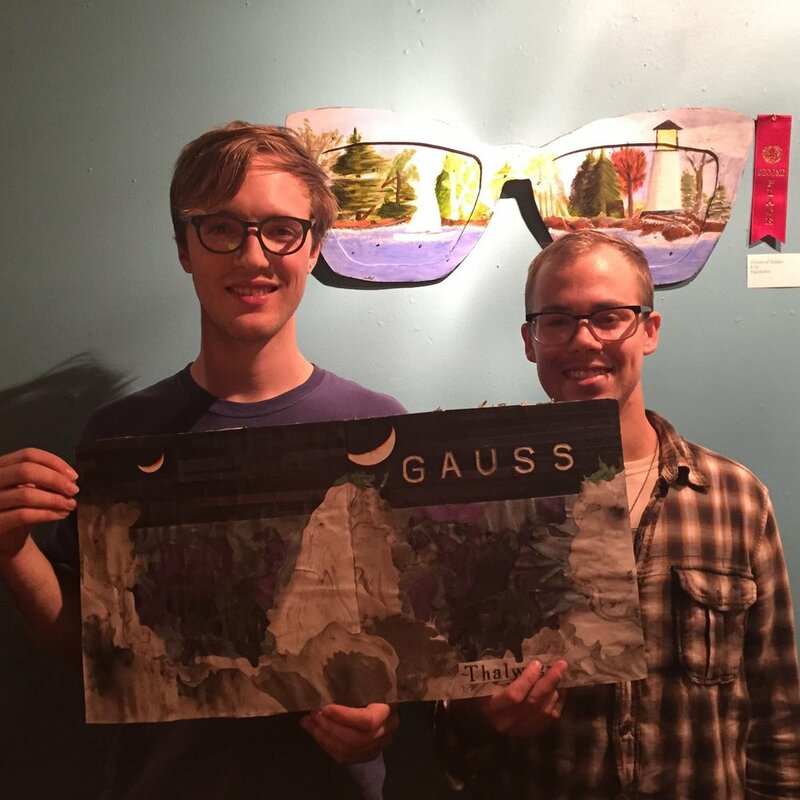 Milwaukee-based punk band Gauss will be releasing their new EP tomorrow. You can stream it online via Milwaukee Record or purchase CDs and cassettes from the group’s Bandcamp page. The album is a high energy composition with articulate and powerful instrumentation. This album is a step away from the group’s normal punk stylings. The songs are written with pop sensibilities. There are textures veering into elements of folk, at times. The addition of horns and strings to the traditional rock instrumentation adds a unique allure to Gauss’ further developed sound. A week ago I sat down with key composers in the group, Eddie Miezio and John Larkin. Gauss frontman Eddie touches upon difficult subject matter, coming out with uplifting and inspiring musings. All together, this EP shows a highly impressive and clean sound from the group’s punk origins. With a well-balanced pace, the album moves from fast punk riffs and heavy drumming to soft horns and meandering string melodies. Overall, Thalweg is a solid EP which reveals the growth and closeness achieved in this outfit - both personally and musically. We are crossing our fingers that we will be able to hear a full-length from these guys in 2017. Could you explain your groups formation? We started in the beginning of 2012 just jamming as a three piece. It was Andy, Jimmy, and myself. We had been playing in punk bands in Riverwest and the East side, playing in basements. My former band was Living & Wrestling. Eric's former band was Alta. He lived at a venue at the time called The Paper Trail and Jimmy was his roommate and asked if he could join. I knew that was very unlike him. We played for about two years playing slow, long music. We were playing shows with YLLA, the band that John and Brandon were in. We asked John to start playing guitar with us. We brought them in to add some stuff to our first full length. In two years we went from a three piece to a six piece. It’s kind of crowded but it's fun. When did you create your name? No, I just say it off the bat usually. Once people know how to pronounce it, they say it well. When was your first show with your current formation? That was probably this April at Company Brewing with Haybaby. We played some shows this winter with Eric but Brandon wasn’t with us. That was the first time we put all 6 of us on stage. I remember that night. A lot of people wondered how they hadn’t heard you all before. It was a really well done set. April was a fun month for us. We expanded a lot that month. It’s tough. It's punk. We are a punk band. We started as a punk band. Being a part of a punk band, for us, was always pushing a little harder and changing the sound and expanding. That’s not everyones definition of punk, but that’s what it was for us. We are still punk but we are kind of like a rock band too. Post-rock? Yeah, I think people would call it that. A band that really influenced when we first started was Duster. We made a lot of slow long songs, with a big build up and climax. Then it’s over. In the last couple of recordings we’ve tried to push away from that and kind of have pop songs. We still have post rock elements, definitely. What other groups have influenced you guys? Personally, I like Kate Bush a lot. I’m inspired by her approach to pop music and the intensity of her music. Even when it’s mellow it's still pretty heavy, it never relaxes really. Some of that comes through. In terms of being a big band, I don’t know. Definitely been inspired and influenced by the band Bark Psychosis. They are an early 90s post rock band. They used trumpet and it's post rock that doesn’t follow the climax format. John says he doesn’t write the songs but I don’t write his parts, you know? Everyone in the band writes their own parts. It's really fun to watch John, Eric, and Brandon working their parts out together. John does a lot of arranging in the band. He will throw out the first melody and we will work off of that. We’ve been exploring a lot of different styles. What effects are you guys using in the live set? John: I play trumpet through my amp with a delay pedal as well as a freeze pedal. That’s it for me. Eric has a pedal board and he will loop things and I don’t always hear whats going on in a song and a song will finish and I will then hear all of the effects Eric had been using throughout. It carries over as we are changing instruments. As we’ve shifted toward pop and indie rock format, we’ve stepped away from that. For awhile, we were playing essentially with no effects. I think there is something about not relying on the effects to make yourself sound unique. If you want your sound to be open and spacey, write spacey parts. Make the instrument do that. I now use a delay pedal for very short delay to give it some space. I use a distortion pedal only to make some noise and feedback sparingly. That’s about it. It sounds like you guys really trust each other musically. You weren’t even aware what Eric was doing during your set. We’ve all known each other for a really long time. We all played with each others bands. We all understand where we are trying to take this. We are still only 6 months into playing with our current formation. We are still figuring out that balance. I don’t think an audience member would pick up on the notion that you guys don’t fully know whats happening on stage with each other. Yeah, we are mostly trying to create simple and catchy music. It has some complexity and layers. We start it simple though. At it's core - it's one idea. So, how was the process of recording your new EP? We started recording in February. We wanted to be done by April or May but of course it took twice as long. We just wrapped it up. We recorded with our friend Kevin Dixon. He calls it Humdrum Studios. He has analog and digital equipment. He’s been recording people for a long time. He has been playing in bands since the 90s. He plays in Brief Candles. He's been a friend and supporter of our band for a long time. He came to us and said he wanted to record some songs. He had an idea going into it. The last time we recorded a long album was quite awhile ago. We just got the art done and the masters back. Sending it off for tapes and CDs. It's all coming together. The release show is October 8th. Yep. It's going to be at Club Timbuktu. There's a Minneapolis band, Miami Dolphins, that's going to play. They are like a noisy punk band. They played in Milwaukee a couple times. Also, Nickel and Roses. I have no idea what it is. And then we are going to have our friend Eli, whose project is Honeymooners play. Have you heard their recordings? Ah, you should listen to the LP. It's my favorite thing that's come out this year. I think it's really good. I am excited. He will be playing solo for our show. He can do a lot on his own. He plays in Cairnes with John and I as well. What is your writing process for these songs? It's changed as we’ve added people into our sound. At this point, I am starting to develop a series of riffs or chords. A lot of our songs have alternate tunings on the guitar. That's my effect. I change the tuning every time so that it radically alters the sound of an instrument. That's how we arrange the set. The order of the songs is what requires the least amount of tuning. I use two guitars. I usually play first with a drummer to figure out the rhythms. Then we add bass. Once we have an idea of how it will sound, then we will bring in John, Eric and Brandon. If you do it all at once, it's too chaotic. Lately, the lyrics have not been coming so easily. They had to wait a long time. It's not a good way to do it. The times that I’ve written a song with lyrics were when I did everything at the same time. Lyrics were stressful and kind of a struggle but I’m happy with the way it came out. What was the struggle? Do you think you were being self conscious? I have been out of school for awhile and I haven’t been reading or writing very much. I read but I don’t really write very much. It was feeling hard to get the words out. I was feeling like I didn’t know what to write about. I don’t write about relationships or things like that. I want to write important things. I want it to be universal and sharable. I want it to help people. They are about negative moments in peoples lives. It's supposed to be uplifting. They are about different points in my life when I felt really down. The closing song on the album was first inspired by a friend who died of a drug overdose and then it was added when a friend really hurt himself. It made me think that when people hurt themselves, they also hurt the people around them. People don’t always realize that. Even if we don’t care about ourselves, other people do. This song is to show people that they are always worth something. Even if you don’t think that you are. They are all positive songs that were inspired by challenging events. John, I heard that you hurt yourself over the summer. You guys got into playing sports? John: Yeah, I broke my foot playing frisbee or basketball. Probably basketball. John: Yeah. I just got out of my boot last Wednesday. Was it difficult playing in the boot? John: It was awkward. I had to play several shows. It was weird doing it. Eddie: Andy, our drummer, is a very athletic dude. It comes across in his drumming. None of us are all about sports. We started to play outdoor athletic games. Brandon too, he’s really good at basketball. I never knew. It became a fun thing to do this summer until all my friends started to get injured and I felt guilty asking anyone to play sports. I guess we are getting older or something. We are all friends. We play music together because we trust each other. Things have changed amongst our friend group and the bands that we used to play with. The DIY punk scene has changed a lot but we’ve all stuck together. Gauss has become a project that keeps that going for us. For our friends who see us, there aren’t a lot of house shows going on. At least that we know about. That is something that I think is really important about Gauss. It's important to me. What do you guys do for jobs? Eddie: I work at the Shorewood Library. I just started going to school to be a Librarian. I’m all about Libraries. John: I do transcription. I’ve been going to school for court reporting. Stenography. Everyone else is a teacher. Or doing 9 to 5 stuff. Andy teaches middle school math. It's full time work and he's in grad school. Last year he was playing in three bands. That's what we mean by athletic. He has a lot of endurance. Eric just started teaching. He is an orchestra director. He’s teaching high schoolers orchestra. Brandon is also teaching music in MPS. He's not the band director but he teaches individual classes K through 6. He has a lot on his plate. It's a new era for us. We all got something going on and it's cool. How does this relate to the band? How do you prioritize your music? We went on a one week tour the summer of 2013. It was really fun. The bands that we used to be in would go on punk tours. Sleeping on floors. We haven’t been able to because of everyones jobs. It's a little disappointing but we made a goal last year where we realized we wouldn’t be able to tour much. We decided that we wanted to get out more in Milwaukee. A year and a half ago, we were playing only in basements and Quarters and Bremen. I could tell there was stuff going on in the scene here. I think we’ve done an okay job at it. It feels good. We want to get out there. We are doing a weekend with Brief Candles in November. We will be playing in Chicago, in Kalamazoo, Michigan and a festival called Kalamashogazer. Then we are coming back to play Milwaukee. I think that's what we are going to do. We are trying to find a show in Minneapolis. It goes so much farther than a one off to the East Coast. If we play on the East Coast once, then never come back or whatever… it doesn’t really get us anywhere. I always like to ask - what have you guys been reading? Eddie: I work at the library so I’m always reading a little bit. One book that I really love that I am excited for is this Chinese Sci Fi trilogy called the the Three Body Problem and the third one is just getting translated. I think it recently came out. It's fluffy but really fun. There are different cultural and historical aspects. There are red guards fighting each other. John: I am reading a book about water infrastructure in different countries. It's called The Big Thirst and I recently just re-read Norwegian Wood. John: A lot of Bill Callahan. Eddie: I’ve been slowing down with listening to stuff recently. I’m always listening to Kate Bush. I always find a new album of hers to get into because I think she's great. I also found a series of Bulgarian Vocal music. It's in an intro to The Ghost in the Shell anime movie. The movie to the soundtrack. I tried to sample it and remix it and chop it up. I thought it was so cool. It’s cool because where Bulgaria is located, they were invaded by a lot of different people. They sing in crazy harmonies. They are just people from the village. It's really spooky music. Notable acts in the music scene? Honeymooners. If they could be a full band that would be really cool. We’ve always loved Brief Candles. They were a band that I heard and later realized they were from Milwaukee. It was a series of revelations that they were band I could go see, then meet and become friends with. They’re great friends now, we have gone on tour with them and they helped us record the album. They are older. They are where we come from musically. Punk and shoe gaze aesthetic. Another act we’ve been really into is Chakara Blu. We played Filth Fest with her and that was really good. We tried to get her to play our release show but it didn’t work out. All of the FREESPACE stuff and everything associated with it. Yeah, I actually had a note about that on my paper. I wanted to ask you about your experience with that. You guys were one of the first non hip-hop acts to perform. We were nervous about that. We didn't think that it was our space, the stage. We wanted to go into it and try to give something back. We planned on doing three or four songs. We decided we wanted to hand over the mic. We were really nervous about it. We were coming up with contingency and arguing: “Would people rap over this?” or “This is too slow” or “If they don’t like this song, we’ll move to this song.” At the break between those songs. Even more I was done with the set kids were excited to come in. It was super cool. John: I remember the song we played. It went for 10 minutes. They had to cut us off. It would’ve gone all night long. There were about 8 people who got out there. Eddie: It’s something we’d like to do again. I like singing but I like stepping away too. We’ve known Vince Gaa (co-founder of Freespace) for a really long time. He used to play in a band with Jimmy called Cheekbone. It was a three piece. He was one of the first people I met in Milwaukee. He has become hip-hop Vince. It’s been really cool. It’s what I’m most excited about in the Milwaukee scene. Eddie: When we were doing all ages basement shows it was mostly college kids. It was a lot of under age people. That's why it was important to have basement shows. It was important that anyone could go. Everyone got a little older and younger people stopped showing up. Turns out young kids don’t care that much about punk music. Now young kids are into hip-hop and that's what matters. The future of a music scene is the youth. That’s why you do it. Old people find reasons to stay in eventually. What do you guys think of the local music scene here? John: It’s a lot of bars. Not a lot of all ages. I think Jazz Gallery is a venue, but it’s a gallery. I heard Modjeska is opening back up. Eddie: That’s awesome. I’ve seen youth theatre there. I got word that Dad is going to do the first show. Eddie: Woah, I want to go to that. Yeah, when the Borg Ward went under, what thoughts did you guys have on that? Eddie: That was our fault. We were part of the community that the Borg Ward was for. We played shows at the Borg Ward. But the only time I went there was when I was playing a show, you know? People blamed it on noise complaints. I’m pretty sure the Borg Ward didn’t get shut down. I think the remaining volunteers were tired of trying. Milwaukee has a number of problems keeping an all ages show. I think the biggest problem are structural problems, licensing laws, and the attitudes of neighborhood associations. Landlords and business owners don’t want that and the laws are not set up to allow it. The liquor laws are not set up for bars to have all ages shows. Really, there is a serious lack of interest in anyone but the youth in trying to have these all ages shows. The youth don’t have much of a voice. It’s a predicament. I would say the music scene is much more exciting than it has been though, on a big level for us. Playing punk music in basements was the only option. We couldn’t go to bars. The bar shows sucked. They were no fun. The bands were garage bands. It didn't seem like it reflected the demographics of the city as a whole and it wasn’t fun. Maybe I wasn’t really around. But we didn’t want to go to the bars because that’s not where the party was. Eventually though, the basement shows dried up. I felt it happening. In all of 2015, you could feel what was going on. All of the shows were suddenly packed with people lined up in the streets waiting to get in. The coolest thing is that there are now people from all parts of the city playing all types of music. It's not just punk or rock. It's hip-hop and jazz and soul and all these different kinds of music. There are things I miss that were there for the punk scene, just outside of punk ethics. The attitude of making aggressive music. Making music that didn’t always make you feel good but punches you a little bit. I think that's cool to challenge people and challenge yourself. Making your set different. I see a lot of the same sets. That comes from people playing tons of shows and being about that. There is a lot more musicianship now but that can be barrier. I liked the punk scene. If you don't know how to play music, just pick it up. Eddie: Yeah, we were pretty apprehensive about that place when it just opened up. But we love playing there. George is a cool dude. The food is awesome and people really come out and see us there. We play Quarters but we have too many people for that venue. We never thought we would say it but we like playing on stages. I like being on a stage. I’m all about being with your audience. I was a drama kid in high school and I like it. People come out to see you and I want to put on a good show and give that back to them. Eddie: Jazz Gallery is cool too. April was a good month. I met you that month, I met Johanna that month. We did FREESPACE at the Jazz Gallery, we played with Von and Pizzle and all of these hip-hop acts for the first time. It was cool. It was pushing us out of our comfort zone and we felt really rewarded for it. It felt really good. Where do you guys want to take this now? What’s next for you all? Eddie: Long term goals. Andy is from Montana. He moved here for school and he’s kind of always wanted to move back. It’s a thing in his heart. There have been a couple times where he’s almost moved away. John: We technically already had our last Gauss show with Absolutely. Eddie: *laughter* Yeah we had a lost show already. He was going to move and then he called me up after the show, a week later, and asked how we would feel if he stayed. Of course it was great. He’s not going to stay here forever. The rest of us are from Wisconsin and have jobs. He has a job too and I’m hoping it will last but I don’t plan on being a band for more than year out of wherever we are. I want to but I try to keep it in my head. I want to get a really good full length out. I think we’ve had experience now that we could do a great thing that we are capable of. We would like to play more shows in other cities. I would also like to play with additional singers, but we have a lot of people in the band. We would like to get out more in Milwaukee. Some mixed genre shows, more community events. It would be cool to play at schools. Even more than a packed club at night with a bunch of Riverwest people. I would rather play to a ton of ecstatic kids. Mostly though, we just need to enjoy every minute. I look forward to practice and just hanging out with these guys. It feels great. It's what I’ve always wanted to do.